With reduced sizes, blankets of diamonds, and fresh marketing language that drops gender categories, it is clear that big watch brands have their eye on women’s wrists. It was difficult to pick just a few from the wide assortment, but here are some of our favorite ladies watches from SIHH 2019. Well before “unisex” became a watch industry buzzword, there was the Jaeger-LeCoultre Reverso. This Art Deco timepiece with a clever case swivel-system has been a classic choice for men and women with great taste for decades. And for SIHH 2019, La Grande Maison pays tribute to the maiden model from 1931 with the stainless steel Reverso Tribute Small Seconds in a captivating burgundy colorway, complete with a Casa Fagliano leather strap. A chic everyday luxury watch that is far from boring. When it comes to high jewelry women’s watches, Cartier is, quite simply, the master. Following up last year’s release of the spectacular Révélation d’Une Panthère watch—where hundreds of tiny gold balls fall across the dial to fleetingly reveal a panther’s head—this year, Cartier unveiled a full diamond version. From the tumbling panther-forming diamonds on the dial to the diamond-set bezel to the full diamond bracelet, the creativity and ingenuity of the new Cartier Révélation d’Une Panthère is a sight to behold. A well-curated timepiece collection should ideally include at least one luxury sports watch. 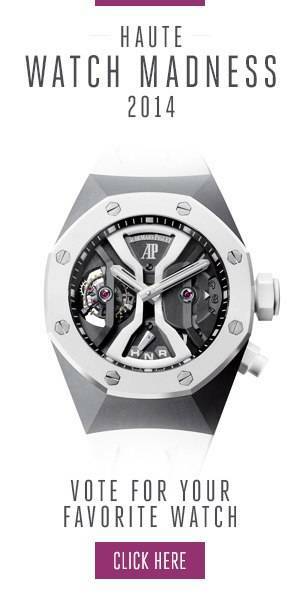 And Audemars Piguet—the brand responsible for kicking off that entire genre over four decades ago—delivered a crowd pleaser with the new Selfwinding Royal Oak Chronograph models, featuring smaller 38 mm cases. Among the four models (two in steel and two in pink gold) the standout option was the pink gold RO Chronograph with matching pink gold registers on the silver-toned “Grande Tapisserie” dial. For the ladies who want mechanical mastery out of their watches, there is Greubel Forsey. This year, the boutique brand introduced their smallest model yet with the white gold Greubel Forsey Balancier Contemporain coming in at just a hair under 40 mm. There is also the diamond-set version measuring a few millimeters larger to accommodate the generous amount of diamonds. True to Greubel Forsey form, the magic is in the multi-dimensional dial, which in this case is purposefully sculpted to show off the manufacture’s exclusive balance-wheel system. While this Richard Mille watch from the saccharine Bonbon collection may not be to everyone’s taste, the RM 07 Marshmallow is a delicious reminder that watches—even those with eye-popping price tags—can be fun and fresh. A juicy ‘gram worthy timepiece if we ever saw one, the dial of the RM 07 Marshmallow looks tempting enough to eat and sits within Richard Mille’s signature ceramic tonneau case in two-tone lavender and white.